We came to the end of February series and overall with very low volatility and range bound moves, it was more or less a tough series for option buyers. The expiry value as prompted by the system was around 6234 levels and the close of 6239 was very close though we did not take any expiry trade this time as we were not having enough profit cushion to take the risky trade. Now that we have entered a new series, system parameters are showing mild bullish sign to being with. There might be a move towards 6285 levels and we might have to watch out for strong indications if at all market is going to cross 6300 levels. We will generally be in wait and watch mode on the first trading session of a new series. We took 5 trades for the series, out of that 3 were winners and 2 turned losers. Overall the profit for the month stand at Rs. 1127.50. There will be no subscription for last month as profits have not exceeded Rs.3000. 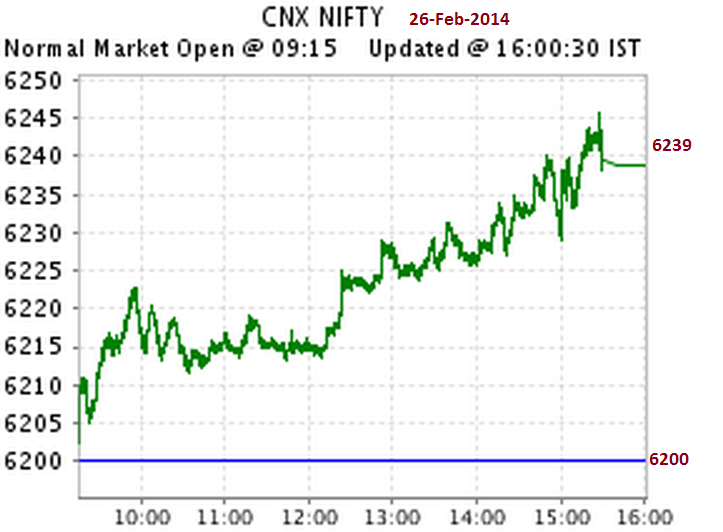 06-Feb-2014,10:17 am 06-Feb-2014,10:45 am NIFTY CE 6200.00 26FEB2014 2 * 50(100) 42.60 29 4260 -1360 Nifty likely to test 6074 levels and beyond. Closing comment: The day low for the option price is 28.50 and it triggerd the stop before the bounce. 18-Feb-2014,10:36 am 19-Feb-2014,3:10 pm NIFTY PE 6100.00 26FEB2014 3 * 50(150) 34 24 5100 -1500 Nifty likely to fall back into range and test 6050 levels. Closing comment: A spike up move in the late afternoon on 19th feb triggered the stop and markets opened gap down on 20th. Position closed at stop price. NIFTY closed last week at 6155 levels, up 1.77% from the previous week close of 6048. 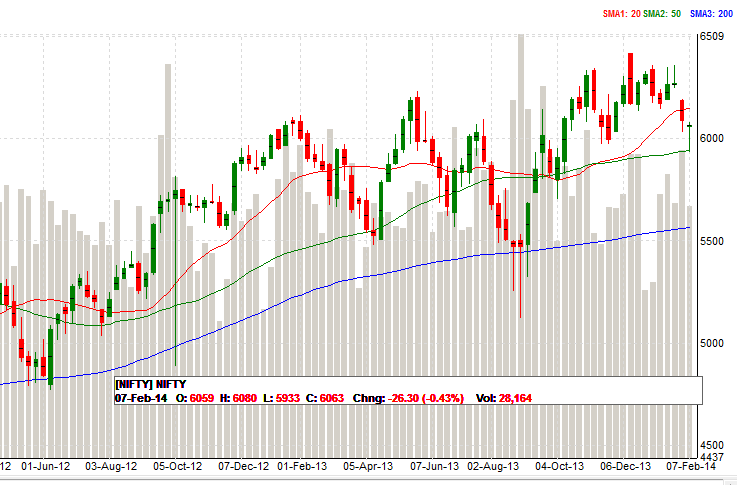 After a good up move on tuesday, NIFTY fell back into range the next two days with again a bounce back on friday. Overall throughout this series NIFTY has been moving in a closed range and though it has made a high close for the series, it looks like upper side is capped for this expiry week with the range being 6050 to 6175 levels. The volatility has been very less for both puts and calls this series and due to this there might be a volatility expansion as well as range expansion move for this expiry on Wednesday. System parameters have been completely oscillating between puts and calls in line with the range bound moves seen. We took a put trade last week and it got stopped out. NIFTY closed last week at 6048 levels, down 0.24% from the previous week close. On the daily charts the 200 DMA levels for NIFTY is at 5981 levels and last week there was a strong down move on thursday to break 6000 levels. The expected recovery till 6050 levels came on friday. Overall it is still indicating a range month with the possibility of NIFTY testing 6117 and 6140 levels by wednesday this week followed by another retest of 6000 levels. System parameters are favouring calls to a good extent considering the IV. OI trend is not fully supporting a major up move at this stage and that is the reason for the expected range for this week and also for this series. 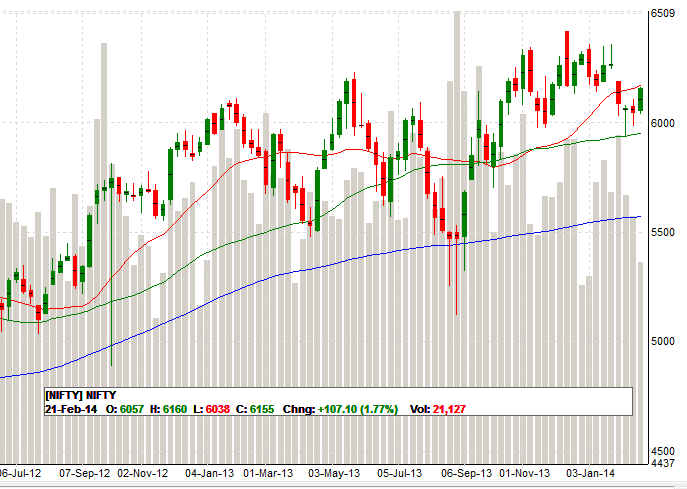 We took a call trade on friday based on the view of NIFTY testing 6050 and target was reached in the position. Last week, bears were able to push NIFTY down below the 200 DMA levels of 5975 and NIFTY saw a low of 5933 levels which is near to the weekly 50 SMA level of 5939. NIFTY gave a good bounce from that level in the succeeding days and closed the week at 6063 levels, a 26 point (0.43%) below the previous weekly close level of 6090. Overall, it looks like markets will remain range bound for this series between the levels of 5962 and 6140 for quite sometime. System parameters are favouring calls to some extent considering the IV skew, but the OI trend indicates resistance building at 6100 levels and it is highly likely for NIFTY to retest 5970 levels in a couple of days. As of now there is no major down side move also seen if NIFTY reaches that level. Last week we took call trade and the details are given below. NIFTY closed January series at 6074 levels on last Thursday after breaching the key level of 6030 which we have been tracking for quite a while. 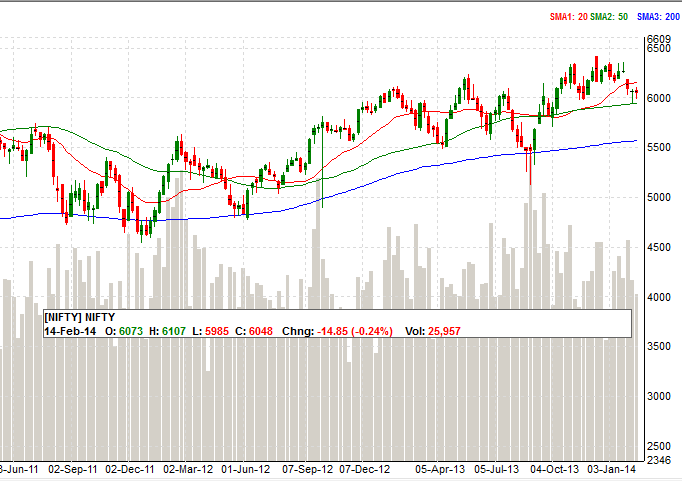 Bears took upper hand towards the closing week and NIFTY corrected 2.8% from that of last week’s close. As we begin february series, system paramters are pointing to a bullish move to begin with. Today markets have opened gap down, but there is still underlying bullishness as pointed by the system and as of now an upmove is expected in NIFTY going forward. Nifty might reach 6140 levels before consolidating and making the next move. We took 7 trades last month and the win and loss in position were alternating. We did not wait for the stop loss to be triggered in the initial call trade and closed it earlier. Similarly the expiry trades that we took, we didnt close out when NIFTY reached the key level of 6030 on one of the trades. Though the bearish view was held for quite a while towards the end, we couldn’t translate them well into executed trades.